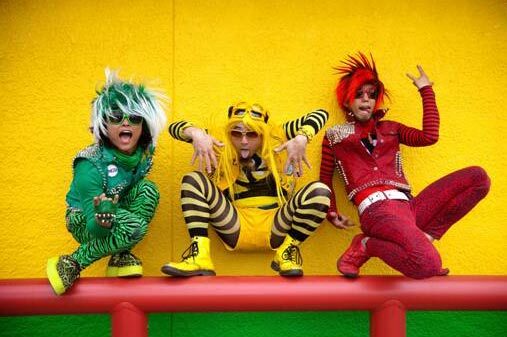 Japanese “action comic punk band” Peelander-Z is preparing to release a retrospective greatest hits album for all of the folks just catching on to a band that has been releasing records and touring for over a decade. The album, Super DX Hitz, will be released on August 9th via Chicken Ranch Records, which released the band’s current album P-TV-Z in late 2010. P-TV-Z will be followed up in the fall by an all-new album from Peelander-Z which the band recently completed tracking at Ohm Recording in Austin, Texas. Super DX Hitz will include 28 tracks, including “So Many Mike,” “Ninja High School,” plus re-recorded versions of “Mad Tiger” and “STEAK.” There are also cuts from every Peelander-Z release from 2001 to 2009, plus selected compilation and seven-inch tracks, along with a couple of rarities. Also included is a bonus karaoke DVD with five sing-along videos. Check below for tour dates and a free MP3 download. Also, click here to read an interview with the band and check out photos from their SXSW 2011 performance!